Cyprus is an European country and third largest island in the Mediterranean Sea. It lies in the northeastern part of the Mediterranean, about 60 km south of Turkey and 100 km west of Syria. Nicosia is the capital and largest city. The island has an irregular shape, a number of wide bays and prominent capes, and two east-west-oriented mountain ranges—the higher Troödos Mountains in the southwest and the lower Kyrenia Mountains in the north-northeast. Between the mountain ranges lies a wide plain, the island’s chief agricultural area that produces grapes, cereals, olives, citrus fruits, and cotton. Sheep and goat raising, silkworm cultivation, and fishing are important livelihoods on the island. Mineral resources include copper, gypsum, chrome, and asbestos. 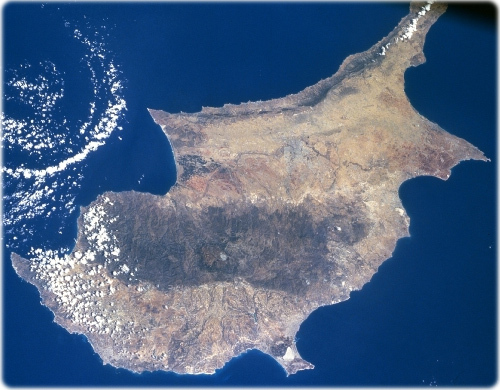 The Island of Cyprus, September 1996 (NASA). Covering an area of 9267 km² and located in the eastern Mediterranean Sea, the island of Cyprus can be seen in this northeast-looking view. Cyprus is located 60 km south of Turkey and 100 km west of Syria. There are three main geographic regions on Cyprus. The Troodos Massif, consisting of mostly volcanic rock and some limestone, traverses the southwest portion of the island (darker feature near the center of the image). Iron and copper pyrites are found in the foothills and asbestos and chromium in the higher slopes of the Troodos. The highest elevation in the massif is 1953 m. Numerous government-owned forests cover the Troodos Massif. On the north coast is the Kyrenia Range, a narrow mountain range reaching elevations of 1000 m. Consisting mainly of limestone, the range is wooded. Between the two mountain ranges is the Central Plain, where 70% of the island’s agriculture is located. The capital city of Cyprus, Nicosia, is situated on the Central Plain. The plain consists of a limestone crust and is considered a flat tableland. Heavily forested in ancient times, today the plain is almost treeless. Copyright © Geographic Guide - Images.